Whether or not you grab Arabic booza from your local corner store, the summers in Beirut are still humid. Half a million people are finally out of their homes, not counting the steady flow of refugees crowding the streets, and the city reeks of burning gasoline, over-piling garbage and citrus. The news that I got accepted into NeXt Doc's 2017 Fellowship felt like a relief, to say the least. There is a sudden time in life that no one prepares us for—an eerie, discouraging limbo filled with false hopes, doubt and irrational expectations. We leave film school confident with our vision—or rather, we know where we'd like to see ourselves. In French, it's called l'appel du vide—the call of the void, this feeling of being in the middle of the ocean with no inclination to return. We feel thrown into this ocean, begging for a way out, yet not knowing how to direct our limbs to get there. NeXt Doc is a five-day intensive documentary workshop run by YouthFX, and hosted by the Carey Institute for Global Good, at their 100-acre campus in upstate New York. Sheltered by surrounding hiking trails, forests and waterfalls, we were in brainstorming, pre-production heaven. I was born in upstate New York, but I was returning there for the first time since childhood. When my fellow filmmakers introduced ourselves to each other, we could sense that we were all stranded in the ocean together, and all too familiar with this limbo we'd found ourselves in. The weather was muggy and we sat in a room overlooking the nearby forest. The rain continued as award-winning documentary filmmakers Sam Pollard, Sabaah Folayan and Cecilia Aldarando shared their wisdom with us. As we walked to and from screenings at the gorgeous Guggenheim Theater back to the master classes, I knew I was exactly where I needed to be: surrounded by a group of 15 young filmmakers from all over the US and, in a few cases, from around the world. The majority of us seemed to be in the same boat: early 20s, fresh out of film school, bewildered, and scrambling for the missing pieces to our future's puzzle. As each speaker reassured us, we also unknowingly reassured each other, like when we jumped in unison during the midnight screening of Get Out or when we shared our intimate pieces for the first time. Sam Pollard took us back to the 1980s, showing us his early work. Ben, a NextDoc Fellow from California, flipped out when he realized that Sam had edited one of his favorite films, Style Wars. Sam talked us through his post-production workflow, from the talking-heads assembly all the way to the final cut, and the ways in which the edit may start intimately and then build out. We were transported through Sabaah Folayan's words and images in Whose Streets? to Ferguson, Missouri, and she reassured us that we may sacrifice a portion of the audience to stay true to one's work. Our final master class with Cecilia Aldarando left heaviness in the room, similar to Sabaah's work. Memories of a Penitent Heart is an introspective documentary illustrating a mysterious look into a family's secrets and past. A few of the Fellows truly connected with the film's subject matter. Bhawin Suchak, co-founder of NeXt Doc and Youth FX, and a force to be reckoned with, became everyone's mentor. On being a person of color in nonfiction, Bhawin shook us with his commentary on the use of the word "subject" when describing your characters. He reminded us of the history of film and the fact that POC (people of color) weren't supposed to be making films; we are just supposed to be the subjects—a devastating truth that raises the question of how is it we flipped the gun and turned the tables on them? We now have access to the tools that were once used to exploit us. 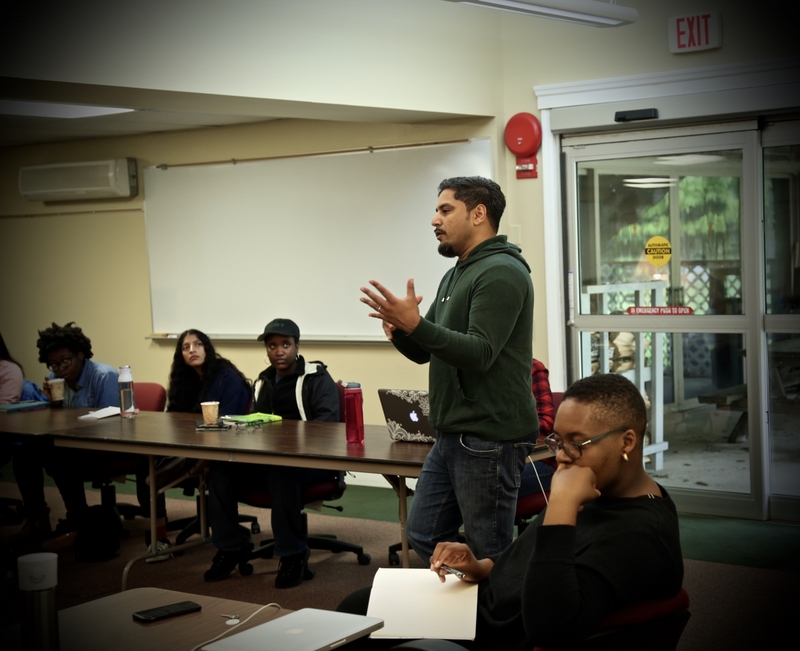 Bhawin and fellow NeXt Doc program director Darian Henry both empowered us, reminding us that our documentaries, our storytelling, were expressions of self-love—an ideology so radical, it felt like they spoke of the unspoken, of raising the status of the oppressed. Bhawin also discussed the white gaze, particular in narratives and how representation matters—the precise topics for any young POC filmmaker. I had never felt so empowered, or felt like there was a language for what I felt, as well as a community. We were placed in what felt like a safe space with individuals who all strived for the same thing. I was raised on this mindset. My mother ingrained the responsibility we carry early on in our lives. She said, "Jude, you are a woman, an Arab, a Muslim; you have a lot to be angry about." She was well aware of the role we had to take in order to be heard. At NeXt Doc I heard her statement put into viable, proactive contexts, in a workspace and nonfiction environment. I was able to successfully link both worlds, to understand the importance behind each grain of sand that falls when my Arabic tongue is used, and to learn how to better shape my position between the east and the west. My mother followed her statement with, "Do something about it." This is why I picked up a camera at 15, took to the streets of Beirut and searched for any story that reflected the emotions within me. I was excited, provoked and anxious—similar to my feelings going into this year's Fellowship. I didn't know what to expect. There are key moments in one's career that add something significant to one's artistic vision, lifting a veil and giving us a glimpse of what we work towards. NeXt Doc became a force field showing us that our voices, images and sounds mattered. We matter. Representation matters. Next Doc gave 15 young, confused, ambitious emerging filmmakers the launch pad and stepping stone to move from here on out. What is a story? What makes a story? What makes it worth telling? If we find ecstasy in the routine, how does one know that that piece is…a piece? These are all questions buzzing in my head daily since film school. My questions may not all be answered, but I feel as though I've been given the tools to go out and find those answers. The program was immersive not only in the fact that our days consisted of master classes with renowned filmmakers but that the program's founders couldn't have been more generous with their time. Our projects were their projects; our mentors took the time to work with us in breaking them down scene by scene, and Bhawin put us in contact with anyone he knew who could further our process. I had never seen such pure generosity with the sole intention of helping us become the filmmakers we see ourselves as. We did not merely take away from the experience a new knowledge, but more important, we had a support system for reviewing footage and pitches, sharing ideas and becoming each other's crew, and congratulating each other on job opportunities and film festival premieres. The last night at NeXt Doc was filled with tears, laughter by the bonfire, and the feeling that we did not want to leave each other. We spent a week sharing our ideas and thoughts and growing artistically together. We each left the institute inspired. I've since returned to Lebanon, and I'm in pre-production on my first feature documentary, which I pitched during NeXt Doc: Behind The Tents, a discovery into the lives of three adolescent Syrian refugees in Lebanon's valley—six years after having filmed them picking potatoes as jovial children before the war—as they navigate their routine lives and search for the hope they once had. As I write, research and shoot Behind The Tents, I remember Sam's advice: be intimate. And Bhawin's: be self-reflective. Now, three months later, we wait to hear about each other's upcoming projects, and review the others' work. To say the least, we are all looking forward to the NeXt Doc reunion. Jude Chehab is a Lebanese-American filmmaker whose early career work has landed over 20 international festival awards. She has led documentary filmmaking workshops in the UK, Lebanon and Croatia, and she participated in Abbas Kiarostami's last student group in Cuba. She is currently the director of photography on the feature documentary Rajada Dalka: A Nation's Hope, documenting the Somali national women's basketball team.